What Awning Type is Best For Summer? If you’re looking for a way to shade, an awning may be right for you. Summer is coming! Is your yard or eating area ready to protect from the harsh sun? Temperatures in Maryland can reach outrageously hot levels. If you’re looking for a way to shade, an awning may be right for you. But which awning type can help you best escape that burning Maryland heat? Carroll Awning Company can help make that decision for you, so you can spend more time enjoying the outdoors. 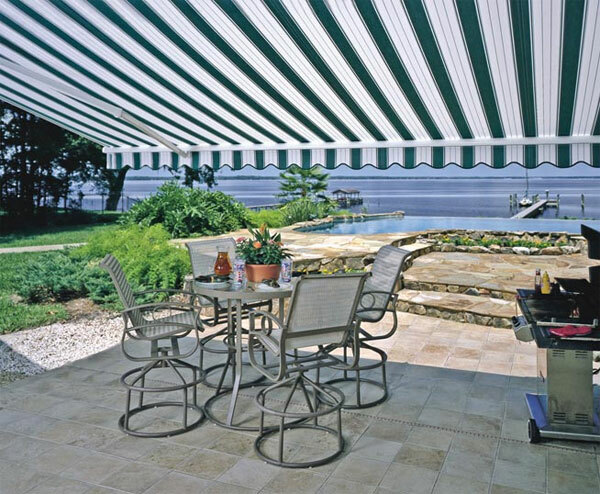 If your space doesn’t always need that extra protection, retractable awnings are a way to temporarily add what you’re looking for this summer. Carroll Awning Company offers a variety of different retractable awnings, which can be put away hassle-free with just a button. You’ll be able to have a customizable, controllable awning in the space you need it most. And the best part? You won’t be sacrificing any structural integrity. With a stationary awning, your options open up in terms of what kind of material you’re interested in. If you don’t think a fabric awning will suit your needs, you can reach for an aluminum awning. These are made with rugged, sturdy materials that will pay off your investment by themselves. Stationary awnings come with permanent installation, and reduce the energy cost that comes with a retractable awning. They’re sturdy. You’ll have the awning for as long as you have the space, no matter the element. These are ideal for a smaller space, and they can be the final touch to your space. If you’re having trouble with the sun beating through a particular window, a roll-up awning lets you shade that area and put away the awning when you’re done using it. This option is perfect for those who are searching for a temporary solution to the summer heat. If you’re searching for the perfect awning for your company or business, a commercial awning is perfect. This is what you see hanging over hotel entrances, restaurants and other public areas. This option will allow you to work closely with architects and designers who have your best interest at heart. You’ll also have the choice of a variety of fabrics to fit your setting. Carroll Awning Company has each of these options and more. You’ll also have full creative access with each choice. If you’re looking for the perfect way to shade your space for the coming summer, we’ve got every available option and we’ll work with you to ensure your satisfaction.